This is the blog that was born on April 12, 2018. Many “chapters” have yet to be posted. Just for fun this year, it came to me to photograph the various improvements that are in progress here. I can share the successes and failures and maybe you will be entertained in the process. My husband and I moved to this property in July of 1988. We had been married nine years at the time. We settled in with two boys and a mortgage. Many years and many adventures have passed in the last thirty years. While eight acres may seem large to many of you, bare in mind, this gal grew up on about 200 acres. 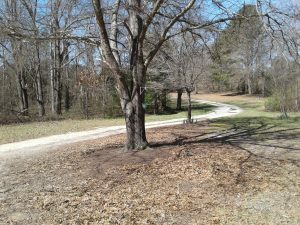 My best memories lie in Edgefield where I spent countless hours at my grandparents’ home. Their property backed up on game management land and to explore those woods was to lose myself in a world of my own imagination. Just me and Cleo. Cleo was the best friend a girl could have.She never complained and was always up for some fun. She was always willing to follow my lead and she could keep my confidence like few people I’ve known. She had warm brown eyes and wiry whiskers. Her nose was cold most of the time. She was the best beagle in the world. Cleo has been gone for a long time and not even a photo remains. Today, I stroll around the yard and enjoy the various plants. Most of them are here because I planted them. The birds will take credit for a few. 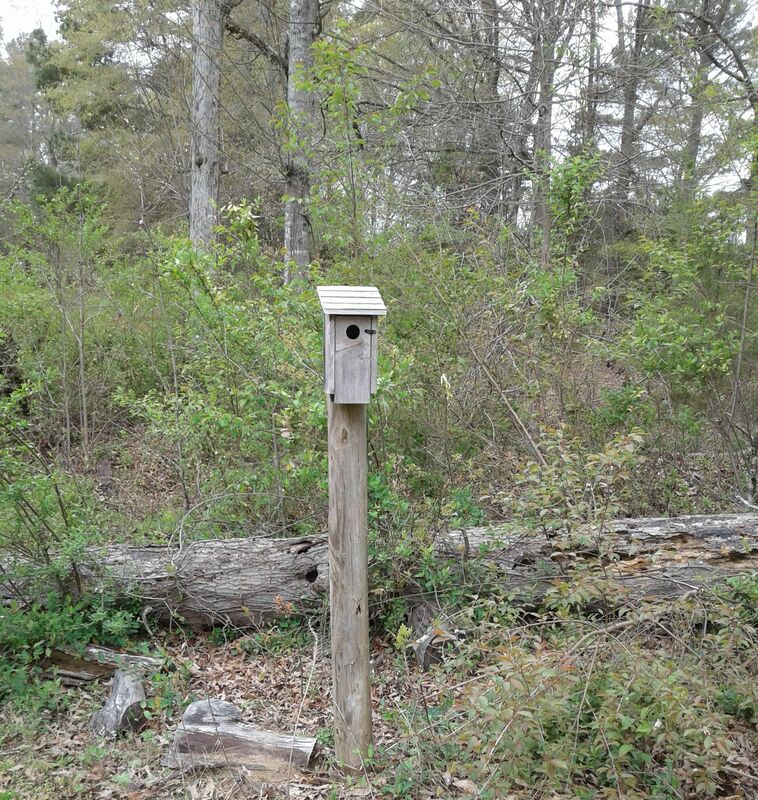 Speaking of birds, my bluebird house is occupied and I am thrilled. 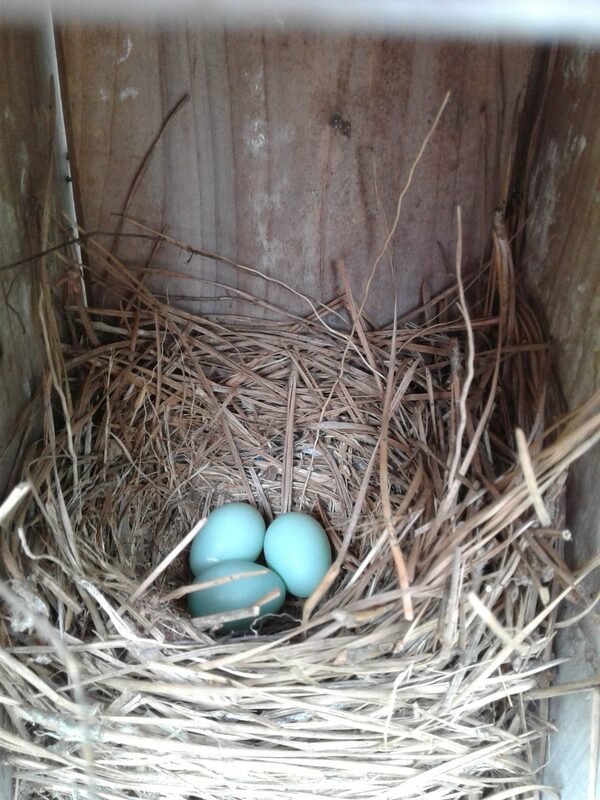 The Eastern Bluebirds have nested. One more egg was laid after this photo was taken. There was some disagreement with a pair of Black-capped Chickadees. 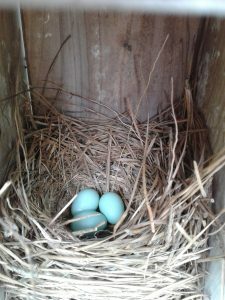 It was a surprise to me to learn that these Chickadees were cavity nesters. I am happy the Bluebirds won out. I placed another bird house several yards away,but so far, nobody has claimed it. In an effort to fix up the small back yard, my husband cut a plastic barrel in half, long ways, and drilled holes for drainage. Using some white spray paint toned down the blue. 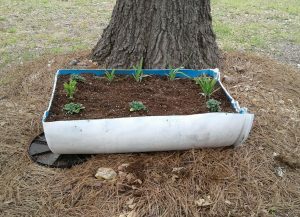 Adding a thick bed of pine needles keeps the rain from knocking mud up on the side of this barrel-now-planter. There are five wave petunias as well as some transplanted Tradescantia (Spider Wort) which is blue. The petunias are purple. I am undecided on what to plant in the middle but there are Sweet William seeds to be germinated. You probably know Sweet William is considered a biennial flower. The seeds that germinate this year will bloom next year. Once established,, it reseeds itself. 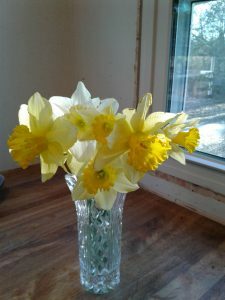 It is one of my all-time favorites for cut flowers. It blooms at the same time as Iris which makes them an awesome pair in the garden. I will be taking pictures as the flowers grow and fill out. The daffodils are gone and these pictures were actually taken in the Spring of 2017. We have since put new windows in the whole house and this was prior to that renovation. 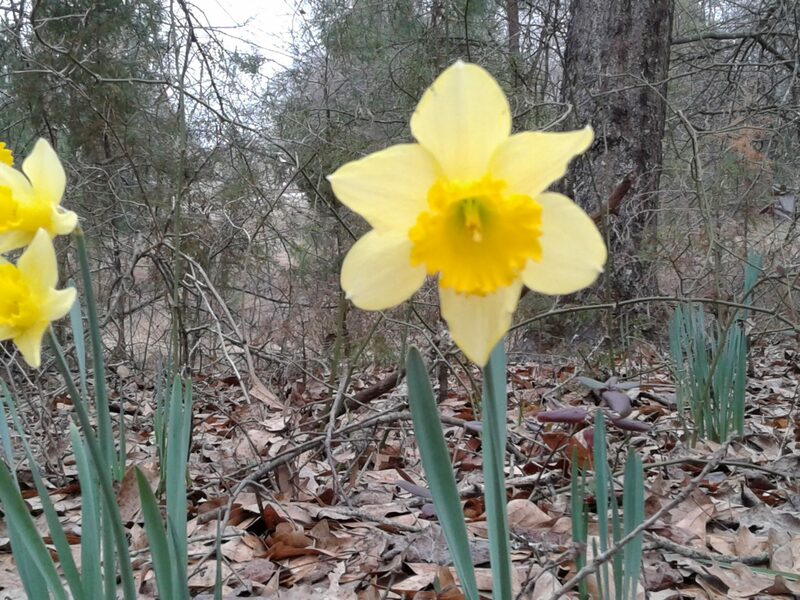 Nothing says “Spring” quite like the first blooms of a daffodil. The forsythia has also moved forward. Known as a Yellow Bell Bush, every plant in my yard is the result of one cutting taken from my grandmother’s bush in Edgefield so many years ago. She would be surprised at how I’ve cared for it. If you have one, or access to one, watch for the new growth. it will be long-ish and a vibrant green. 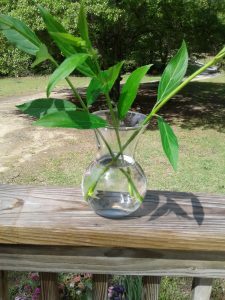 Cut the new growth about 10 or 12 inches long , remove the lower leaves and place in a clear glass container. I usually use a jelly jar. 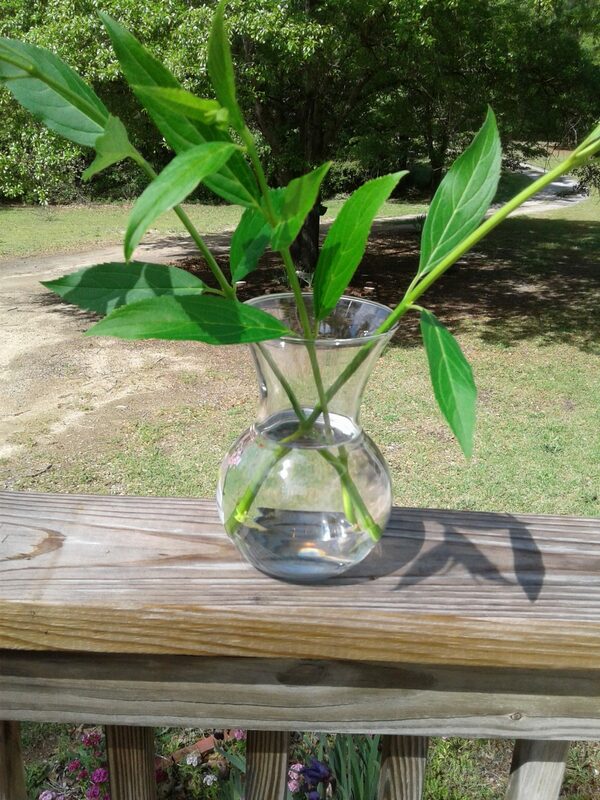 (I found this vase doing some spring cleaning.) Place in a sunny window and add water as needed. Never change the water, only add to it. By the end of the summer, you will have new plants. The roots will look like spaghetti. When the leaves start to turn color, it’s time to put them outside. I have some that have done extremely well and there are three that the deer have eaten, repeatedly. (insert angry face) Forsythia makes a nice stand-alone pop of yellow or they can be grown in groups to make a hedge. These cuttings are being grown for a friend. I snipped them on April 27, 2018 and they will spend several weeks standing in my kitchen window. It’s a blessings to share my plants with others. 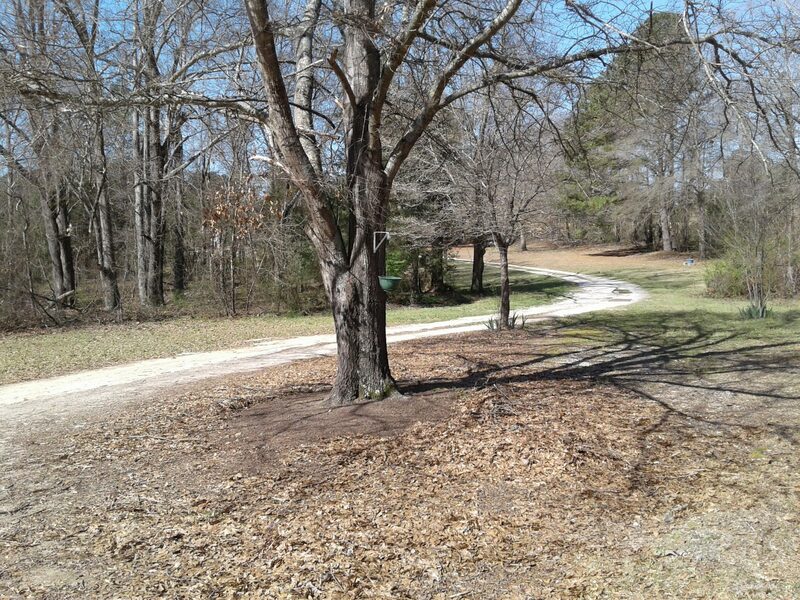 There are two oak trees in the front yard. I’ve decided to call them Fred and Wilma. Fred stands off to one side and I’ve just raked the leaves at the base. There’s a concrete slab close by with a pile of mulch on top. Wilma can be seen from my kitchen window and “she” is getting a face lift. 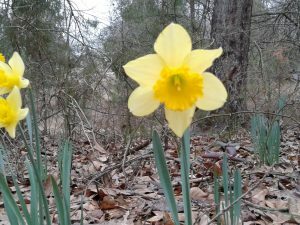 (watch for photos) ~ Researching what will grow under an oak tree has led to some lovely discoveries. 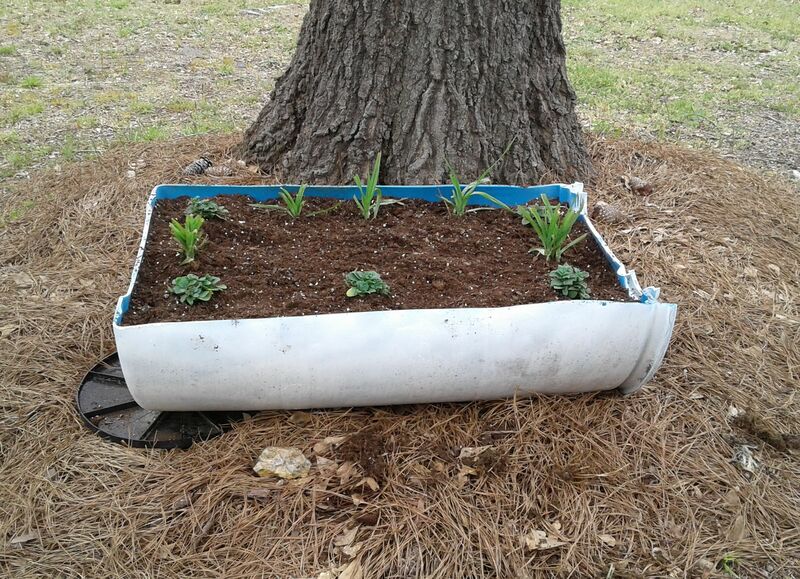 Iris will work and I’ve transplanted several. A hanging basket contains a wave petunia. 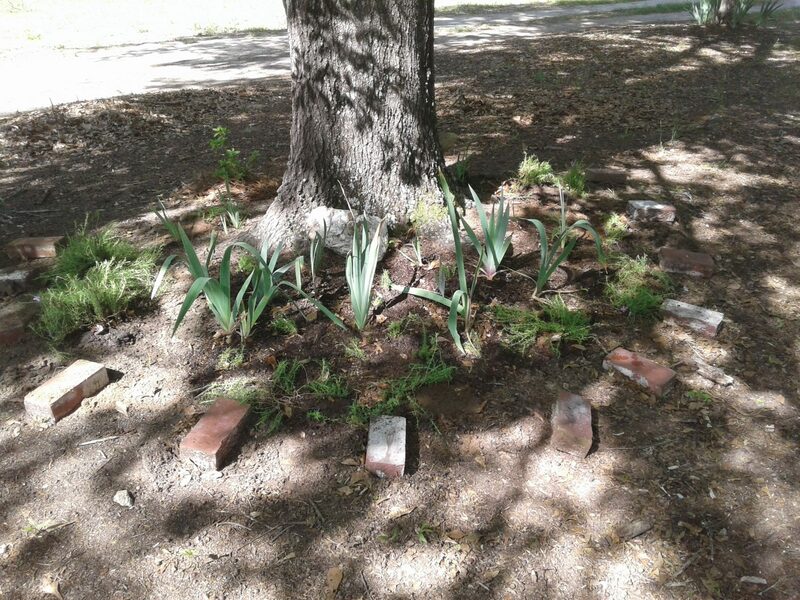 Creeping Phlox will grow with the iris and there are plans to move some. The bricks are marking the spaces for new plantings. Have you seen Coral Bells? This perennial is amazing. A member of the Hosta family, I’ve fallen in love with a variety called “Electric Plum”. I’ve got a couple of starter plants coming from Minnesota. I’m planning to set them out in a large container on the patio. They need to be a good size before turning them loose at Wilma’s feet. Deer resistant and holding their color for a long time, I’m looking forward to their arrival. Meanwhile, I’ve been staring at these bricks. It’s in my mind to use some glow-in-the-dark paint so the bricks will really shine! So many projects, so little time.